Joaquin Phoenix is in talks to star in Todd Phillips' upcoming Joker Origin Movie. The project is reportedly set outside of the DCEU where it will be a standalone movie. It had previously been reported that Leonardo DiCaprio was in serious talks to play the Clown Prince of Crime, but sources close to Warner Bros. now say that Joaquin Phoenix is the frontrunner. After the failure of Justice League at the box office, many assumed that the Joker movie wasn't going to happen anymore, but it appears that the movie is still very much in development. Though Leonardo DiCaprio's involvement always seemed too good to be true, it appears that he was closer than we previously thought. 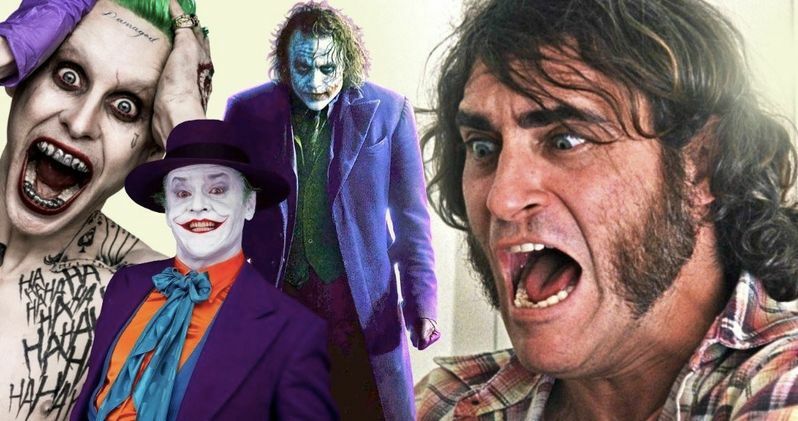 A new report states that Todd Phillips met with the Academy Award Winning actor 4 times before Joaquin Phoenix became the frontrunner for the Joker origin movie. Phoenix is reportedly in talks and is close to making a deal with Warner Bros., which is huge news for the project and for the new label of DC Films that the Joker origin movie will reportedly be under. Jared Leto was the last to portray the Joker for some limited screen time in Suicide Squad and was blindsided by the news that someone else would play the character in a different movie, put out by the same studio. However, Leto is reportedly in talks to make a return as his version of the Clown Prince of Crime for Suicide Squad 2 along with Margot Robbie as Harley Quinn, but nothing has been officially announced at this time. When asked recently about when we'd next see Harley Quinn on the big screen, Robbie admitted that she wasn't sure. It will be interesting to see how Warner Bros. handles an announcement of the standalone Joker movie with talks of Suicide Squad 2 starting to ramp up. Two movies with two different Jokers does seem a bit like how DC Films would run things before the restructuring that took place behind-the-scenes earlier this year. It's going to be a tricky situation to say the least. Additionally, it will be interesting to see which movie gets announced first. Will it be Suicide Squad 2 where fans are clamoring for more Harley Quinn, or will it be the standalone Joker origin movie? The talks of a new DC universe that is separate from the DCEU seems reminiscent of the standalone Star Wars movies, which have worked out thus far for Lucasfilm and Disney. The new DC banner may be just the shakeup that Warner Bros. needs to get back on track and make some truly awesome comic book movies. For now, we can speculate about how cool Joaquin Phoenix will be as the Joker in an origin story. We know the acting will be top notch, but where will he take one of most famous villains of all time? You can check out the original report over at Variety.